The Brome County Historical Society museum, located at 130 Lakeside in Knowlton, has set up a new display booth marking the 100th anniversary of the world's first radio broadcast. If you don't know why there would be such an honoring of this milestone it is because that in a small house across the street from the museum in the year 1866 Reginald Fessenden was born. Fessenden's name is not widely known he definately should be recognized as a pioneer in communications. He literally became the world's very first DJ when, on Christmas Eve, 1906 he played a recording of Handel's "Largo", then read some passages from the Good Book, then played his violin before wishing a Merry Christmas to sailors who were listening on United Fruit Company ships. He had transmitted the first voice message in 1900 and after studying electrical engineering and working with Thomas Edison as a chemist he went on to patent more than 500 ideas and devices! 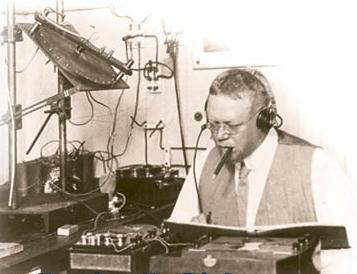 Knowlton is proud to be the birthplace of the father of AM radio and it's good to know that the whole DJ Culture that is so popular with kids these days was actually started right here by one of our own...the original DJ Fess!! Fessenden is also credited, among other things, for the creation of the first sonar, the early technology for beepers and pagers, the incredibly usefull garage door openers and even the tracer bullet! He was inducted into the Canadian Telecommunications Hall of Fame in 2005. Buy & sell, garage sales, etc.